very quickly, and as long as there's a food source, they'll be there. And the worst idea of all is poisoning. That only kills a percentage of the rodents, who will likely die in the attic or walls, and cause a horrible stink in the house. Then new rats will merely take the place of the old ones, and it's a never-ending process. Most pest control companies are lousy at getting rid of rats for good, but we pride ourselves on providing a permanent solution. We are a professional wildlife removal company, offering mouse and rat control services. We aren't a pest control or mouse and rat exterminator company. We provide effective mouse and rat trapping and prevention for a completely solution to your Houston mouse and rat problem. How do we solve Houston rat problems permanently? The key is stopping the root cause of the problem - we inspect every inch of your house or building, and find out how rodents are getting inside. We seal all of these holes shut, using professional steel repairs that rodents can't chew through. We then trap and remove all the rats, and the problem is solved. We are not Houston rat exterminators - we don't use poison, because it is not effective at permanently solving the problem. Rat chewing wire - A rat chewing on a wire is not some phenomenon that occurs because the rodent likes the zing of electricity. Rats chew on anything and everything. Even if they can’t chew on it they may still try. The problem is that so many wires run through the average home that rats have ample opportunities to damage the cords that provide people with electricity. Wires are small enough to fit nicely in a rodent’s mouth. Not only are the malleable, they are easier to grasp than the flush surfaces of drywall or wood. If you have discovered chewed wires, you have an immediate fire concern on your hands. Once an electrician has been called in to do damage control, the rats inside your home need to be removed. It is possible that the rats are no longer inside the building. You should never make this assumption. Regardless of an existing issue or not, you need to go over the exterior of your home to find any openings. Rat holes are usually surrounded by a ring of grease from the animal’s body oils. If you find an entry hole with this characteristic, seal it immediately. Other holes in the home need to be repaired as well or they may turn into future rat holes. 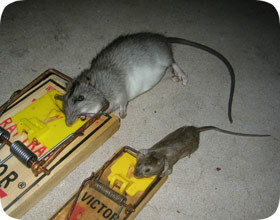 How to Get Rid of Rats in Houston Texas - Rats are truly pesky critters that no one wants at their home. They get into everything and are the kind of animal that literally scares everyone. With their large pointy teeth and ominous looking bodies they are truly terrifying to have around your property. The problem is that once you have rats they can be very difficult to get rid of. You see rats don’t come with just one or two of them being in your home. They are not like squirrels or raccoons, who live fairly solitary lives. No, rats love to live in large communities, so when you have one you can be sure that there are many others around. This is where the true problem exists. You want to get rid of these horrific creatures, but to do so you have to battle a whole army of Houston rats. You need to find a strategy that allows you to get them all out at one time, or you will simply allow them to regroup and build a new nest somewhere else in your home. That is obviously no solution at all. Getting rid of the rats is your first priority, and there are a few different things you can do to help you accomplish this. The first thing you want to do is to close access points they have to the main part of your home. This is the most important step in Houston rat removal. They may be living in your walls at this point, or around the outside of your home, so keeping them out of the main part of your home becomes your priority. You want to make sure that if there are cracks or holes in your wall that lead into rooms or hallways, especially the kitchen, that you close those up so they cannot get into the home. The truth of the matter is that if they are living in your walls, but cannot get access to where the real food is, they will either do one of two things. They will leave, which is what we want, or they will do what they can to gain access to where the real goods are. By that point you will have figured out a plan to get rid of them. As a general rule, you want to seal holes and entryways with steel wool or scouring pads. These are not only tough for the rat to chew on, but they are also quite irritating to it, and that should keep them away from these spots. You want to ensure you check these spots on a regular basis just to be safe. Rats are masters at finding those things that have fallen to the floor, under tables, on counters or in the back of the pantry. This means you need to do a great job of keeping your home clean. Put your food that is normally in boxes into an air tight container, and put them up higher. It is a very good idea to keep your trash cans as far away from the house as possible. If they are attracted to what’s in the can, keep them out there and not close to the house where they may decide to search for better stuff. Your next step is to use substances that act as repellants to the mice. You can go and buy commercial products, but they will not work very well. These emit an odor that is quite repulsive to rats, and that is saying much. There isn’t much that they are not prone to enjoy, but there are some things, and these commercial products have the stuff that should give you little success in keeping the little vermin away. We also do not recommend the use of poison. Some Houston rodent exterminator companies use poison, but it does not permanently solve the problem, and it can create new problems, such as stinking rats in the attic or walls. Learn how to keep rats out of the garden using natural techniques. There are natural things you can use, however, that will do the trick. One of the best of these is peppermint oil. The smell is quite overwhelming to rats and they will stay away from the oil. What makes this so great is that most critters do not find the scent appealing at all, so you are not attracting other problems by using this to remove the rats. Simply put a drop or two on a cotton ball and leave the cotton balls all over your home. This should help to keep them away and, if they are in your home, it should help to get them to look for a new place to live. One of the best deterrents to mice or rats is a cat. It is just instinctual that rats hate cats and with good reasons. Rats are the Lex Luthers to these super vermin. If you have lots of rats in your home you simply can’t have 8 or 9 cats to try to get rid of them. The solution is to simply put a little used cat litter around your home. The cat urine is enough to scare away the mice, because they will think there is a cat wherever they find the scent.